The Munge Dweevil (ムラサキショイグモ?, lit. 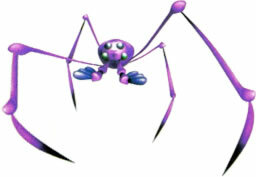 : "Purple Carrier Spider") is an enemy in Pikmin 2. Like other types of Dweevil, this creature is commonly seen retrieving enemy corpses and treasures. When agitated by attacks, it will release a cloud of gas that will poison the Pikmin. This suitably makes White Pikmin the best choice in battle, as they are immune to poisoning. However, the Munge Dweevil has more health than its relatives. Alternatively, as Purple Pikmin can stun any small Dweevil with a 100% chance, they will easily defeat one. Munge Dweevils scurry about randomly and take no note of the presence of any leader or Pikmin if left undisturbed. When provoked, one will attempt to defend itself by releasing poisonous gas below it. This poison will scatter all attacking Pikmin, and eventually kill them if they are not whistled back to a leader. Munge Dweevils are frail creatures (though less frail than all other common Dweevils) and will die quickly if attacked by even a few Pikmin, or by the punches from a leader. When a treasure or a corpse of another creature is nearby, a Munge Dweevil will lift it up onto its head and carry it, making it impossible for Pikmin to collect until it is broken free. When a Dweevil has an item in its possession, it will stay at rest, crouching down, appearing as if it is only the item, until it is approached by a leader or Pikmin, at which point it will stand up and run away. Attack it with whites. Aim precisely to kill it quickest, as it moves constantly and has a very small head, which is the weak point. Another way is to grab a large load of reds and swarm it. It will die in seconds. If it, for some reason, is able to attack (even if it dies, if it has started its attack, the animation will continue), whistle back the Pikmin, as they will easily be harmed by the poison that is emitted directly beneath the creature's head. If whites are not available, it's probably better to kill it with leaders. Purples also work, as they have a hundred percent chance of stunning any small Dweevil. Using leaders is ultimately the safest strategy, as poison poses no threat to them whatsoever. Run up to it and attack it, and just keep punching until the creature is dead; don't even run when it attacks; it's harmless. If you lie down, the Dweevil will pick you up and you can ride around on its back for a while. When you are ready to kill it, just press / to kick its head and stun it. Then, just punch it to death. This works for any small Dweevil. Its name may be a misspelling of the word mung, which refers to something that is filthy or the act of creating filth. The word "munge" itself is used in computing when data is altered from one format to another. In Japan, its name is ムラサキショイグモ?, which is the same as the name of all minor dweevils, but starting with ムラサキ?, which means "purple", given that the spider is in fact the only purple member of the family. Its scientific name is Mandarachnia pungetis, where Mandarachnia is the genus name for the dweevils and pungetis is similar to the English word "pungent", which is a word used to describe strong or horrible smells. Internally, it is called gasotakara, which is a combination of "gas" (because of its poison gas) and "otakara", which means "treasure". A Munge Dweevil in the Piklopedia. A Munge Dweevil releasing poison gas to defend itself. This page was last edited on April 6, 2019, at 20:43.